This page covers 5G millimeter wave frequency bands. It mentions 5G bands and 5G mm wave bands. It mentions all the millimeter wave frequency bands also. Above table mentions millimeter wave frequency bands. 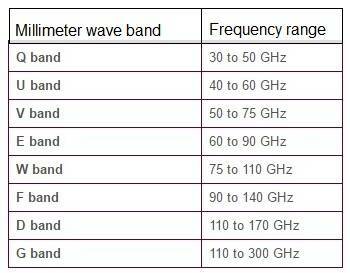 • As mentioned in the table millimeter wave uses frequencies from 30 GHz to 300 GHz in EM spectrum. • 5G uses upto 100 GHz i.e. 5G millimeter wave frequency bands lies from 30 GHz to 100 GHz. • The three popular bands with bandwidths are listed below. • Upto 40 GHz, carriers are aggregated to achieve higher bandwidth of 1GHz. • Above 40GHz, bandwidths from 500MHz to 2 GHz can be achieved without any carrier aggregation method.